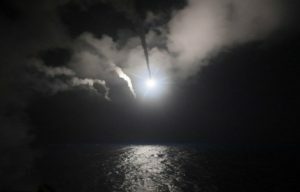 Here are four articles presented in two parts that will give my geopolitical and prophetic take on what comes next after 59 cruise missiles were launched off Syrian shores by the US Navy on Thursday 6 April 2017 on President Trump’s orders. There are patterns of past war-feverish moods being repeated. Patterns of manipulation have returned not seen since October 2002 when Secretary of State Colin Powell flashed his fake vial of anthrax powder before the United Nations Security Council and then US Congress, and President George W. Bush’s National Security Advisor Condaleezza Rice, ranted about Saddam’s secret chemical weapons arsenal being an imminent threat to the United States. Mushroom clouds, she said, would be blossoming over American cities any moment unless Congress gave her president the powers to invade Iraq, if need be. The case presented by Rice and Powell was mostly written up and pushed by Bush’s Who’s Who of top US neoconservatives crowding his cabinet as the custodians of Bush’s “brain.” An assumption of pure biased intent was made to tie Saddam Hussein’s overthrow to al-Qaeda’s attack on “9/11.” Ideology blinded neocons in the Bush Administration to facts. It was noted by witnesses that when the chief neocon running the Pentagon heard the news that the World Trade Towers were under attack, Secretary of Defense Donald Rumsfeld immediately blurted out to his assistants that Saddam Hussein must be responsible, check it out! A link was never really found. That didn’t matter to Rumsfeld. An opportunity had been handed to the neocons, the “Pearl Harbor” long-awaited moment foretold by their evolving manifestos published since 1992 was on. The necessary evil of a surprise terror attack had happened, and like the surprise airborne attack by the Imperial Japanese Navy that dragged the US into the Second World War, 9/11 would likewise instantly end all political bickering and divisions. Under national threat US Congress, and Judicial system, the Republican “and” Democrat citizens too, would automatically rally in lockstep behind whatever their president needed legislated or legally enacted, in his new and vaguely-defined world war on terror. Neoconservatives could hasten their agenda to spread American hegemony and overthrow rebellious sovereign states, like Saddam’s Iraq, that had too much control of global oil reserves American needed to fuel its imperium. Within two weeks of the 9/11 attacks, their plans were made apparent to the Pentagon’s top generals. We have a reputable witness who confessed as much in a videotaped interview before a hall packed with thousands of witnesses broadcasted on YouTube. He was four-star General Wesley Clarke, the retired former Supreme Commander of NATO forces during President Bill Clinton’s second term in office. The following is a transcript of the shocking, premeditated neocon plan to exploit the 9/11 tragedy that eventually led to the 2002 congressional vote giving Bush carte blanche war powers that he later used to invade and occupy Iraq, a quagmire that led to the deaths of thousands of American soldiers and upwards of a million Iraqis. It brought Islamic terrorism into the heartland of the Middle East and spawned an even worse terrorist threat than al-Qaeda, ISIS, the Islamic State, the result being a Middle East and the oil it possesses, existing in a more unstable state than ever before. To launch what eventually turned out to be a military and financial disaster for the United States, Bush used what he called his “useful idiots” (the neocon name for the US mainstream press) to propagate a war fever based on false intelligence or wishful thinking that was printed and broadcast as unquestioned truth. (Sounds like fake news, doesn’t it?). A brave journalist, like Pulitzer prize-winning Chris Hedges of the New York Times, who printed a skeptical inquiry questioning whether Saddam Hussein actually had chemical weapons, was forced to resign. I said, “Well, you’re too busy”. And he said, “No, No…” And he said [with emphasis], We’ve made the decision, we’re going to war with Iraq”. This was on or about the 20th of September . He said, “I don’t know” [crowd laughs]. So I came back to see him a few weeks later and by that time we were bombing in Afghanistan. He reached over on his desk and picked up a piece of paper. [Amy Goodman] “Go through the countries again?” [Crowd laughs]. In 2002 the Congress gave President Bush the power to make war with Iraq—chief among the notable US Senators who gave their avid bipartisan support with little skeptical inquiry was the 2008 Democrat presidential hopeful, Hillary Clinton. Now given this enabling act, Bush precipitously invaded Iraq with US forces advancing out of bases in Kuwait on 20 March 2003 starting the worst US military quagmire since Vietnam. It was only after the occupation led to the Iraqi state imploding into guerrilla warfare against the occupiers, who later found themselves caught in the crossfire of a sectarian Shia-on-Sunni Iraqi civil war, did reason and facts get a hearing. Whenever it is too late, a thing called EVIDENCE is examined “after” the fever of popular support was spent, the first bombs had fallen, first blood was spilled, and Iraq collapsed as a state needing a financially crushing investment of US nation building. That’s when you find out Saddam Hussein HAD NO CHEMICAL WEAPONS. There was NO CONNECTION BETWEEN AL-QAEDA AND SADDAM. Conclusion: the invasion, followed by eight years of a bloody occupation was launched on myths and falsehoods. Seven thousand Americans were destined to die, 35,000 destined to be wounded, half of which became seriously crippled for life and between 500,000 to 1,000,000 Iraqis would be killed. This turned out to be a falsely-flagged threat by neoconservatives. Sorry Condoleezza Rice, no mushroom clouds over US cities, just an expenditure of US wealth “mushrooming” to $3 trillion squandered between 2003 and 2011, when US forces temporarily left the mess they made of Iraq only to return again to fight the consequence of their strategic disaster, the Islamic State, invading Iraq out of Syria in the summer of 2014. From 2002 we see this pattern repeating itself in 2017. Cruise missiles “shock and awe” the same news anchors like Brian Williams to gush exultantly while all objective journalism critical of such US moves is stifled. Once again, I saw the press in early April 2017 become the press of the 9/11/01 and October 2002 days. They became a soundpiece for phony intel. Missiles are launched and leaders from Bush to Trump say their evidence is “slam dunk,” irrefutable, when actually no fact finding has even been engaged, and there’s a mountain of evidence out there that makes precipitous US military action in Syria unwise and certainly uncalled for. It is all too familiar to me, an individual and meditator, someone who does not belong to any mass-minded crowd, what has been set in motion once again. “Stupihistory” is being repeated again. A new generation of men and women honestly serving their country will be exploited by an enemy they never at first knew could later destroy their lives, limbs and minds. I will tell you why so many US veterans are caught in an existential downer and committing suicide at rates per day that exceed the average fatality daily death tolls in the worst of days fighting in Iraq (2003-2011) and Afghanistan (2001-forever?). This will-to-self-destruction is mostly unconscious, but it is there. No one talks about it too much. It is an existential fact that goes against all that our brave men and women in military service when they swore to protect and defend the United States. At some level, deep in their hearts, they feel that they are not serving anyone else than billionaires running up wild profits perpetuating a warmongering business model. Our soldiers are unwilling “employees” pressed into military service to a corporate imperium interested only in perpetual conflict manufacturing. They fought and died for Exxon, not “Xcom” or any other military “com” command defending the Untied States. They were useful cannon fodder feeding wars engaged to either control or overthrow regimes existing independently of us, whether we liked it or not, overtop huge oil reserves US neoconservatives believed belong under American imperium control. The American press and people are also being played. The latter annually pays $1 trillion a year into a perpetual corporate welfare racket for warmongers, that is, if you count Pentagon and Homeland Security budgets together, serving “War on Terror” Inc. Ever since the Cold War, and especially ever since 9/11, these bellicose business interests have been seeking to create a new cold war with Russia and a surrogate cold war in the Middle East that will forever provide low-grade yet bloody military conflicts requiring re-armament making billions in profit. Even better are the markets I call “ISIS containment” and “demonizing Putin and Russian containment” that could increase and extend unimaginably higher profits from arming themselves and allies for decades laying siege to real or made up enemies. August 2013! There, my friends, was an attempted repeat of pitching war fever upon you and congress the same way you were being conned in 2002. On 21 August 2013, there was a terror attack on that day similar to 9/11, using weapons of mass destruction with thousands killed and injured. From images of falling towers taken down by passenger jets as weapons, we move to pictures of row upon row of fallen, dead kids stacked like cordwood in al-Ghouta, an eastern suburb of Damascus, Syria. They were purportedly gassed by chemical weapons—most likely the nerve agent sarin—in a missile attack we’re breathlessly told was fired from Syrian government lines into a Free Syrian Army controlled neighborhood. Just like in 2002, when the press is commissioned to get you all worked up to invade Iraq because “Saddam did 9/11,” any calls to first investigate evidence about who shot at al-Ghouta and with what before going to war were ignored as the press fanned war fevers. The US Secretary of State at the time, “Mr. Ed” aka John F. Kerry, and the so-called US chief diplomat for promoting “peace” was an even louder advocate for war than his overly cautious president. The opportunity to take Syria down in flames in August 2013 was nearly in neocons and Kerry’s grasp. To hell with the consequences for the people, the region, the world! But that window was slammed shut because of a “peacemaker” stepping in to decisively close it. Peacemakers are public enemy number one to the US Military Surveillance Industrial Complex and what galled them most was “this” peacemaker.” He, of all people! Putin! The president of the Russian Federation. The peacemaker who just happened to be the target of neocon campaigns to create a new bogey man in Russia to sustain the strain on US public funds needed to prop up a cold-war sized US military even thought there wasn’t a an equally formidable “Soviet” armed force left standing or a cold war threat existing since 1989. Vladimir Putin’s our new bogeyman! But then, Putin suddenly negotiates with a reluctant Kerry an eleventh-hour diplomatic move, gets his ally President Assad in Syria to give up his chemical weapons arsenal to UN inspectors. They soon ship the stuff out of Syria and destroy it in ovens located in the US, Finland and Germany in one of the most successful disarmament attempts achieved while there was a bloody civil war going on. Did you hear much about it on the news? This peaceful resolution and disarmament of weapons of mass destruction was hardly broadcast by the mainstream media. Peace? Where are the TV ratings from broadcasting that? The UN announced in the following year that all the chemical weapons in the Syrian government areas were removed, but they could not vouch for chemical weapons and stockpiles seized by the FSA (Free Syrian Army) in the parts of Syria this rag tag group of militias, mostly made up of Islamo-fascist jihadists, controlled. That was about half the country at that time. Note this important pattern from 2013, because it has arisen again. Basically it takes no Nostradamus to predict that when Assad and the Syrian government and army are beginning to win the civil war, forces in the world act that do not want them to succeed and have peace descend on Syria. Remember the FSA was receiving billions of US dollars for training and arms to bolster its shrinking “moderate” secular militias. By 2013 these had mostly abandoned the Americans, with all that expensive armament in hand, and joined the other FSA militias belonging to the same people that killed nearly 3,000 Americans on 11 September 2001, al-Nusra AKA “al-Qaeda.” A year later, in 2014, al-Qaeda operatives in Syria would split in half. Thus, half those US armaments would be taken to conquer eastern Syria and invade northwestern Iraq held in the hands of a new and fiercer jihadist Islamo-fascist group, ISIS (the Islamic State). Armed to the teeth with US weapons they plunged into Iraq in June 2014. Soon they collected a whole lot more US weapons—about 20 billion worth—abandoned by four divisions of the Iraqi Army they routed when occupying Iraq’s second largest city, Mosul. ISIS took huge swaths of territory in the Sunni provinces, riding their US manufactured trucks all the way to the approaches of Baghdad before their advance was halted, more by logistics than by a spirited defense. I would say the US war business made a good investment arming “both sides.” They got a new “evil” to contain and contain ISIS they did for nearly three years and counting with token bombing runs by US and NATO coalition jets keeping that stream of rearmament orders flowing, but not really doing any significant damage to the Islamic State. What I’d like to call “American Warmonger Inc.” got a chance to draw another $30 billion dollars worth of profits out of the Iraqi government rearming and rebuilding the Iraqi Army for its push to retake territory and Mosul. That offensive was leisurely postponed until the Iraqi’s were certain they had enough armored columns, artillery and an expanded air force to manage it. Moreover, when the American warmongers were sure they couldn’t make them purchase any more stuff, that’s when it was time to lose it again in fighting for Mosul, starting in the autumn of 2016 and ongoing for six months and counting, requiring a steady flow of more war stuff and ordinance purchased. Business couldn’t be better in Iraq. However, in Syria, Assad had messed with their market model in September 2015. He asked for Russian military intervention and in came Moscow’s air force now based “in country” along with Russian special forces and military advisors doing what war profiteers hate with all their rancid guts. Once positioned in Syria by October 2015, the Russians started air attacks that actually “hurt” ISIS where one year of US-NATO token bombardments hardly scratched. They began bombing and setting on fire thousands of ISIS-driven oil tankers. They had been rolling unmolested for a year in great snaking convoys passing through the desert under US jet shadows back and fourth from Turkey, doing a wicked black market business in oil trade, paid in billions of paper US dollars the Islamic State needed to finance its pirate Caliphate Islamic State, government and pay its armed forces. Next, the Russians gave ground and air support to the Syrian Army, the best army fighting al-Qaeda and ISIS, and helped them roll both terror groups back, liberating large portions of the Syrian population from grim occupation. The tide was turning. You have to really hate Russia if you are a US war profiteer, whether you like their politics or not, because when they fight, they fight to end wars, not perpetuate them. It isn’t just a business with them. Actually, peace really “is” their profession. Soon the Syrians and the Russians were exposing for those few news outlets interested, filmed and documented proof that the jihadist forces the US supported had left behind in liberated territories and cities, like the eastern half of Aleppo, evidence of factories for building chemical weapons and delivery systems. During the four-years the Siege of Aleppo dragged on, I’ve seen the footage the US mainstream media ignores of al-Nusra chemical weapon attacks on Syrian soldiers and civilians living in the government-held half of Aleppo. I’ve watched the innocent children, women, crying mothers and fathers your US news anchors “do not” fawn over or emote sympathy towards. Have you seen the now famous little blood-soaked boy sitting shocked and forlorn in the ambulance from Eastern Aleppo? I’ve seen him “and” scores of blood-soaked and gassed little boys and girls wounded and killed by the daily terrorist chemical weapons attacks fired out of Eastern Aleppo into Syrian government held Western Aleppo. You’re not meant to get the full, fair story. You’re supposed to choose sides—the corporation’s choice—to their war market advantage. Showing the murdering going on committed by “both” sides would go against the programming that keeps you Americans suckers for fighting. The militarist American regime must have you glue your emotional dewy eyes to edited televised images of the world’s complicated problems reduced to simplistic, black and white, binary solutions—their “1” pitted against the other side’s “0”. They need your black and whitewashed minds. Your America, right and wrong, is always the good guy living in a hostile world that “hates our free-dumbs.” US War Inc. conditions your minds into fighting, dying, and seeing the lion’s share of your taxes go to shoring up their war businesses and markets, rather than see your wealth gift you free collage tuition, affordable universal health care, millions of jobs to rebuild your bridges, industries, water and power grids, etc. You won’t see the raw footage of evidence of abandoned chemical weapons-making labs filmed like those recorded by English free-lance war correspondent, Lizzie Phelan, because NBC, ABC, CNN and Fox won’t broadcast it, only Russia Today shows them. Oh! “Of course!” That means Phelan is some drone of an evil Russian government news propaganda network. Just remember how Moscow’s government-financed network is suspect the next time you turn on the BBC, Canal 24, or American news on PBS, or NPR radio—they are all government channels too. Do you ever question “them”? Once the Russians and Syrians finally drove the jihadists out of Eastern Aleppo, hundreds of tales of horror were recorded about how these “allies” of the US and NATO, terrorized, starved and tortured the occupied population. (See Eastern Aleppo) Syrian TV and Russia Today will show it. Not US media. It wasn’t the Syrian Army but al-Nusra troops leaving behind mass graves in prison basements. I saw that footage too and now you can see the other side of this story. Even your eight-year old, brand spanking new president, packed in a seven-decades old body, watches what you watch: the same US media-filtered world view that influences his sudden impulse to fire cruise missiles on Syria on 6 April 2017. Trump is being programmed well. So well! Now he’s acted, decisively. Something Obama didn’t have in him. Now history runs on the warmongers’ course with another gullible president pretending he’s at the helm, only this one doesn’t wring his hands. This one is the other extreme. He jumps right in before he knows what really happened and where he’s being taken by the US war industry. Once upon a time, in late August 2013 to be exact, there was a real estate, reality celebrity star named Donald J. Trump who channel surfed the TV in his penthouse atop Trump Tower, watching the news in the wee hours of many a sleepless night. He regarded President Obama ready to rush in like a fool on little or no evidence to start a shooting war with Syria. The only reason President Obama wants to attack Syria is to save face over his very dumb RED LINE statement. 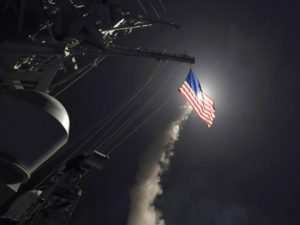 Do NOT attack Syria, fix U.S.A.
President Trump striking Syria on 6 April 2017 has begun doing everything he thought Obama would do and shouldn’t do. He knows the “freedom fighters” in Khan Sheikhoun, Idlib Province, are members of the al-Nusra front; they hate Americans and in early evolutions as al-Qaeda struck his beloved New York City that he went on so passionately about in the Presidential Debates. Trump was once obviously aware that Saudi Arabia and Qatar are financing the US backed rebels whose warehouse of armaments got bombed on 4 April 2017. 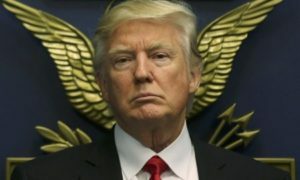 Trump has just killed innocent civilians and kids in his retaliation on 6 April. A lot of his cruise missiles never reached the target and came crashing down on civilian villages and farms. Trump just blew $85-to-$114 million dollars on launching 59 cruise missiles. Add to that the cost of sending two Navy ships to their launch off battle stations, the fuel and other logistics expended and we’re looking at a close to a quarter-billion bucks blown. Now he’s ready to escalate the cost further and strike again if more chemical weapons attacks happen. If I were al-Nusra, or ISIS, I’d be planning a number of false flag attacks I could tag on Assad, get more US billions flowing in US airstrikes at America’s expense and my advantage. Trump charges ahead, no congressional approval required. He’s the one “shooting first and asking questions later!” Forget Obama, Trump has crossed a red line, indeed he said “many red lines” where crossed. At least Obama defined his red lines. Trump ad libbed a bunch of red lines at the press conference held just after the Syrian Air Force’s Khan Sheikoun airstrikes. Does that multiply his “stupid” becoming “many times” multiplied to Obama’s? Stupid sees “as” stupid then “does”—the mysteriously stupid 180-degree turnaround that has Trump actually doing what Obama in the end felt was wiser to avoid. Syrian President Bashir al-Assad’s motive for using chemical weapons on a warehouse in Khan Sheikhoun on 4 April 2017 is even more unclear and irrational than the far more deadly al-Ghouta gassing of August 2013, because this time, it’s official, declared by the United Nations no less. Assad since 2014 had no chemical weapons. If that was a lie then why would he expose his dirty little secret, lose all international credibility, and once again, nearly four years later, when categorically winning the civil war, squander even more gains, risking annihilation, when chemically bombing some glorified “garage” in Khan Sheikhoun? I don’t get it. You’re Syrian President Bashar al-Assad. You nearly get your country bombed back into the Stone Age in 2013 and you’re going to tempt fate AGAIN, to flatten a frigging garage, perhaps a little “mom and pop” chemical weapons factory? The Western press would say with no proof that you got away with launching a chemical weapons attack in 2013 killing thousands of civilians. That you launched it in rebel territory on the day the United Nations sent a team of scientists at long last answering your many requests for an examination of evidence implicating frequent rebel chemical weapons attacks on your soldiers and civilians. Is this really the right moment to fire sarin-tipped missiles into the eastern Damascus suburb of al-Ghouta? Does it help your case if the world is watching FSA (Free Syrian Army) sourced videos of piles of corpses, what they claim are 1,729 men women and children gassed to death, and video feeds of a further 3,600 injured residents gasping and vomiting in emergency rooms of Ghouta hospitals? Obama was primed and readied by these images, and then pressed by his Secretary of State John Kerry and his new neocon friends, to launch punitive airstrikes that later leaks revealed were more than punitive. The target packages planned rivaled the infrastructure devastation unloaded on Iraq by President Bush Senior’s months of air strikes across Iraq softening the country up for Operation Desert Storm (1991) and the “shock and awe” air campaign launched by Bush Junior in 2003 for Operation Iraqi Freedom. Simply put, what was left standing in Syria in August 2013, after years of brutal civil war, would be destroyed. Syria would obviously implode as another completely failed state—tens of millions of homeless Syrians on the move, ten times worse than we see happening today, so far. Back in August 2013 I wrote articles for Hogueprophecy.com, pointing out how there was no motive for Assad to effectively cross Obama’s red line, fire his chemical weapons on rebel-held cities and towns. The timing of the attack on al-Ghouta was suspicious from the start as it was irrational. This is not how a man like Assad acts. Yes, he’s no boy scout, true, but he is a calculating, rational operator. Assad is an authentic survivor and true survivors DO NOT cross lines drawn by the most powerful hegemonic military power in history when the outcome is obvious. Why, oh why, my readers, would Assad cross a line that would bring in an overwhelming US military response, play into all those Washington political and military business interests that wanted to take his regime and what’s left of Syria down in flames? Up to that point he had survived three of the six years and counting of military and political pressure from EU and US leaders calling upon him to step down. By 2013, the “Assad must go!” campaign was showing signs of weakening. Clearly he was not going. The FSA fighters financed and trained by the US were faltering, many of them were crossing over to ISIS and al-Qaeda forces in Syria, with their training experience and weapons in hand. By 2013 there was no “moderate” rebel army left to “make” Assad go. Assad instead did what he does best. He survived the al-Ghouta gassing escalating into a cataclysmic US air strike. Yet here in April 2017 a threat comes again packed in the same pattern, the same manipulative way the corporately owned US media and government “advertises” to make you buy into their perpetual war “product.” Only this time Assad just before the bombing of a rebel (read al-Qaeda) weapons dump and armament factory in Idlib Province happened was not only surviving but also unquestionably winning the civil war. Al-Qaeda forces lost their siege on Aleppo and retreated into Idlib and Islamic State is about to lose its capital, Raqqa in Syria, and is losing Mosul in Iraq. Heck, Obama after five more years of saying “Assad must go” let that go in the last months of his second term. The new President Trump didn’t take up Obama’s motto or the push for Assad’s step-down until the gas emanating from a thoroughly-bombed weapons factory outside of Khan Sheikhoun on 4 April 2017, prompted a complete Obama-aping turnaround. Trump struck Syria with a cruise missile attack out of an emotional impulse from watching news feeds filmed by al-Qaeda affiliates (of course we should trust them!) displaying dead and dying children as collateral casualties of evil Assad’s “sarin”-no-less, chemical attack. Why then, with even more to lose than in August 2013, would Assad on 4 April 2017 pull out of hiding chemical weapons he had sworn he no longer had and signed that claim on the dotted UN line? Kiss away any surviving political credibility to negotiate a peace deal—your political capital is spent! All those years trying to stay alive and in power, now you really do have to step down. And for what? A glorified garage attack outside of Khan Sheikhoun with your secret “doomsday” cache of chemical weapons? Why do that and for what advantage? Why use them on a warehouse in the backwater town of 50,000 souls when you might need them in your last stand defending Damascus, your capital, like Adolf Hitler in Berlin? You want to pull them out at the last resort. Who knows? A threat to use them in your last stand in Damascus could be a bargaining chip for your safe surrender of you and your family. But… (slapping the side of my head to wake up) Wait a minute! There’s no Battle of Berlin “last stand” scenario for this dictator, only one that his enemies, in al-Qaeda “and” in Washington DC, must generate every time he’s winning his civil war. The truth is this, and eventually you will all be shown what I am saying is actually the case: neither the Syrian Air Force so-called chemical attack on 4 April 2017, nor the al-Ghouta attack in 21 August 2013 came from Bashir al-Assad or the Syrian armed forces. The first question to ask in unraveling this caper is a common-sensical one: Why do you attack a military armament dump with chemical weapons, people? You use them on people, attacking soldiers, not stockpiles of guns, tanks and artillery shells, correct? You’re going to “kill” a shell by gassing it? Next question: what’s Assad’s motive? You don’t chase six years of a remarkable survival story, then turn the military tide in late 2016 bringing a rapid and victorious conclusion of your civil war in sight, then attack the enemy with chemical weapons you swore you got rid of and erase all that you’ve gained. Note again the repeating pattern of anti-Syrian Regime behavior in the West. Back in 2013, Assad was winning the civil war because the US trained and armed FSA was coming apart. Time to bomb him! Or, pin a gas attack on him. Fast forward to 4 April 2017. Certain special interests in perpetuating the war and chaos in Syria might want to try a “set up” or exploit a military incident as something other than what it was, an attack that destroyed jihadist chemical weapons stashes in Khan Sheikhoun. If you are the owners of that warehouse, you’re a member several extreme Islamo-Fascist militias serving in the al-Nusra front. Allah knows you don’t want the UN inspectors sniffing around the warehouse ruins; otherwise, they’d uncover further documented evidence that you rebels had a stash of chemical weapons of mass destruction that Syrian bombers struck, inadvertently releasing some of the gas and toxic chemicals for making it, killing 83 civilians who lived nearby. Now, back to the far greater chemical attack that killed and maimed thousands. What if Assad didn’t cause the al-Ghouta attack in 2013 at all? What if there’s solid evidence proving it was al-Nusra with some surprising help from a US NATO ally? “The joint chiefs also knew that the Obama administration’s public claims that only the Syrian army had access to sarin were wrong,” wrote Hersh. Washington powerbrokers and corporate controlled US mainstream media organs might let CBS peep a report only once, late in the half-hour of nightly network news, but you won’t see these facts emphasized or repeated. Seymour Hersh couldn’t get his report published anywhere in America, not even in his usual outlet, the New Yorker for that same reason. How can you propagate regime change if the other side you are supporting is also a chemical weapons user, who has “not” surrendered their chemical weapons to the UN? You don’t want the public to find out that the rush to war over the al-Ghouta chemical weapons attack in late August 2013 wasn’t actually fired from the Syrian government controlled part of Damascus, but “inside” the Syrian rebel lines, and from an area occupied by the forces of al-Nusra (aka al-Qaeda terrorists). You don’t want published what Hersh’s contacts in the CIA showed him was evidence that remnants of the missiles fired proved they were a type that couldn’t have been launched outside of al-Nusra held territory but inside it, because the models recovered had a shorter range, rendering a launch from Syrian Government lines impossible. Is it not a signature of al-Qaeda operations that they use the terror of large-scale attacks with massive loss of life to advance their jihadist holy war agenda? Nearly 3,000 American civilians were killed in the World Trade Center and Pentagon hijacked jet attacks. Over 1,700 killed and 3,500 wounded at al-Ghouta. The civilians were supporters of more moderate rebel groups, not al-Nusra. If you’re al-Qaeda at (blackest) heart, why not slaughter them? They’re all apostates anyway, doomed for Hell. Make it look like the Syrian government did it on the same day UN inspectors fly into Damascus. Start a blame game against Assad and feed the regime change frenzy in Washington that will get the Americans to destroy Assad with their overwhelming forces. Thus collapses Syria into a failed state, in which al-Nusra and other terrorist organizations can thrive and spread, just like what happened in Iraq with Bush, in Libya with Obama. How about Syria with Trump? What Hersh reported in his London Review article that the New Yorker editors dared not touch points to these conclusions as the real facts. Since he published in June 2014, Hersh has been vindicated by independent investigation completed in Turkey and reported by Turkey’s top newspaper, Zaman on 21 October 2015. First consider this second passage from Seymour Hersh’s report published in The London Review and then a following excerpt from the Turkish research study published in Zaman that backs it up. Excerpt from London Review of Books, published on 17 April 2014, by Seymour Hersh, full title: The Red Line and the Rat Line: Seymour M. Hersh on Obama, Erdoğan and the Syrian rebels. The remaining articles are waiting for you. They contain over 11,000 words of predictions, analysis and further sources and video links that expose this Syrian Government chemical weapons attack as something other than advertised by the mainstream media and the US government. Plus it will take you through the next steps in Trump’s “Trumped” Diplomacy. If dark and shadowy powers inside the government get a free pass without being exposed, the American people will be dragged once again into a Middle East military quagmire far bloodier than any occupation of Iraq had ever been. It could escalate into a thermonuclear conflict with Russia no later than November 2017. Put Hogue Bulletin in the Subject line. When I receive your PayPal donation, I’ll send the download manually with a personal comment in a few moments or few hours depending what time of the day or night you’re sending it. Thank you for supporting Hogueprophecy! Not getting the bulletins? Corporate anti-virus filters are most likely blocking them. You can trick them by entering a completely new email address. Here’s where you can resubscribe. This entry was posted in Syrian Civil War and tagged 59 tomahawk missiles, 9/11, al-Assad, al-Ghouta, al-Nusra, al-Qaeda, Aleppo, Amy Golden, Assad, Barack Obama, Britain, Bush, CBS, Chris Hedges, CIA, cold war, cold war two, Colin Powell, Condaleezza Rice, Damascus, Democracy Now, Donald Rumsfeld, Donald Trump, Eastern Aleppo, Erdogan, Exxon, FSA, G.W. Bush, Ghouta, GOP, Hillary Clinton, Hitler, Hogue, Idlib, Idlib Province, Iran, Iraq, ISIS, Islamic State, Islamo-Fascism, John Hogue, khan Sheikhoun, London Review, M16, Middle East, Mosul, NATO, neo-liberalism, neoconservitive, Nostradamus, NSA, Pearl Harbor, prediction, predictions, President Trump, prophecies, prophecy, prophet, Putin, Raqqa, Saddam Hussein, Seymour Hersh, Shayrat, Shayrat airbase, shock and awe, slam dunk, Stupihistory, Syria, Syrian Airforce, Syrian civil war, Syrians, The Donald, the real donald trump, Trump, Turkey, UN, United Nations, US Congress, useful idiots, Vladimir Putin, warmonger, Wesley Clark, Zaman. Bookmark the permalink. Post a comment or leave a trackback: Trackback URL.